They marched and gathered by hill and valley, going ever by tunnel or under dark, until around and beneath the great mountain Gundabad of the North, where was their capital, a vast host was assembled ready to sweep down in time of storm unawares. Order your own copy of Mount Gundabad at your local retailer or online through our website today! 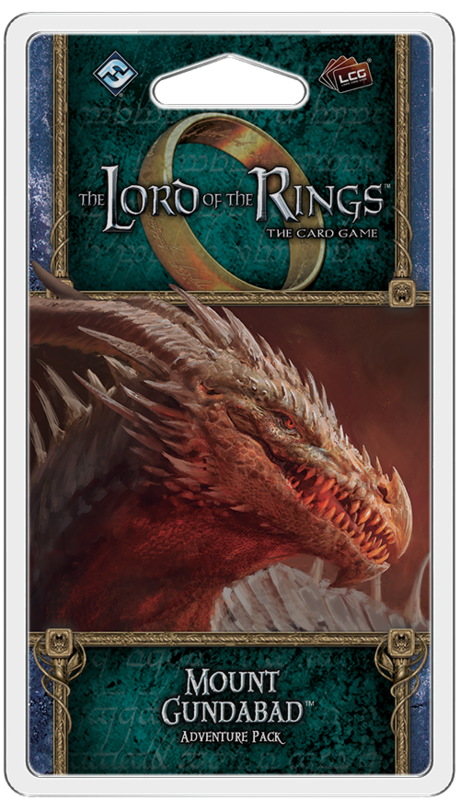 Fantasy Flight Games is proud to announce Mount Gundabad, the fifth Adventure Pack in the Ered Mithrin cycle for The Lord of the Rings: The Card Game! The time has come. All your adventures across Wilderland have pointed you in one direction: toward Mount Gundabad and a confrontation with the terrible Dragon that roosts within. While few would openly rush into battle with such a beast, one thing remains certain: Dagnir poses a threat to the whole of Wilderland, and you must take on whatever risks are necessary to keep it safe. Completing this task will not be easy, of course. Hordes of Orcs litter the mountain stronghold, standing between you and Dagnir. Even worse, there’s no telling where she has built her lair within the cavernous mountain stronghold. But there can be no turning back now. Gundabad awaits. After encountering countless terrors in the forgotten city of Framsburg, there is only one thing left to do. Your path leads to Gundabad. Fortunately, your party knows of a secret entrance that should let you slip into the mountain unnoticed. Once inside, however, there’s no telling where the many passages lead or where you’ll find the Dragon you seek. Your quest into Gundabad, then, begins not as an assault, but as a search. 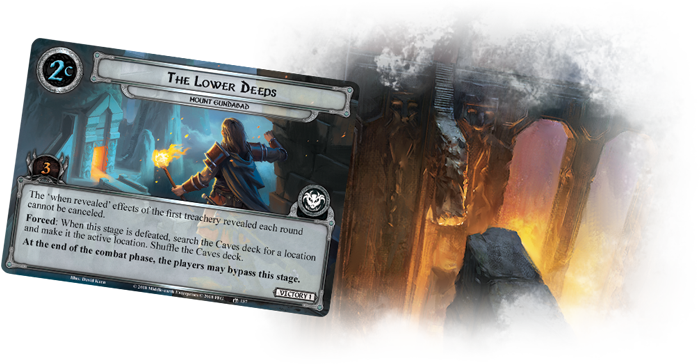 Combining several of the mechanics you've encountered throughout the Ered Mithrin cycle, this adventure forces you to carefully choose what goals you will pursue. The twisting halls of Gundabad are dark and vast, and only by exploring these Deep locations can you hope to find your destination buried within the Caves deck. At the same time, once inside the labyrinthine mountain fortress, you’re sure to come across several obstacles that will slow your progress as you seek to defeat Dagnir. 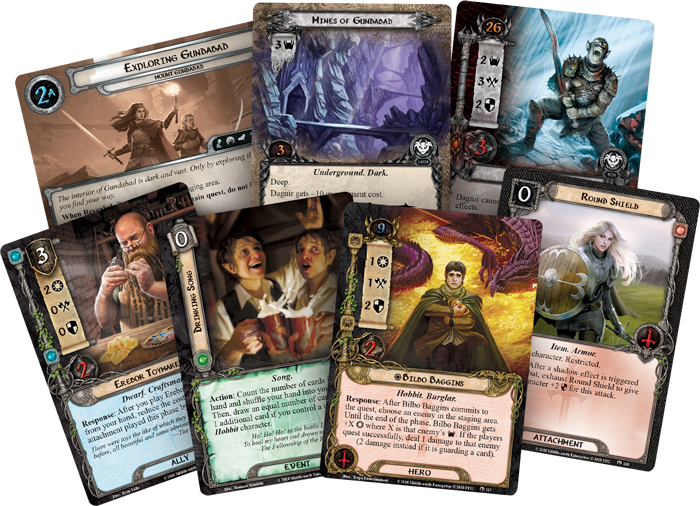 In this Adventure Pack, the obstacles that you face are represented by a randomized deck of eight Stage 2 quest cards that you must progress through until your quest is complete. 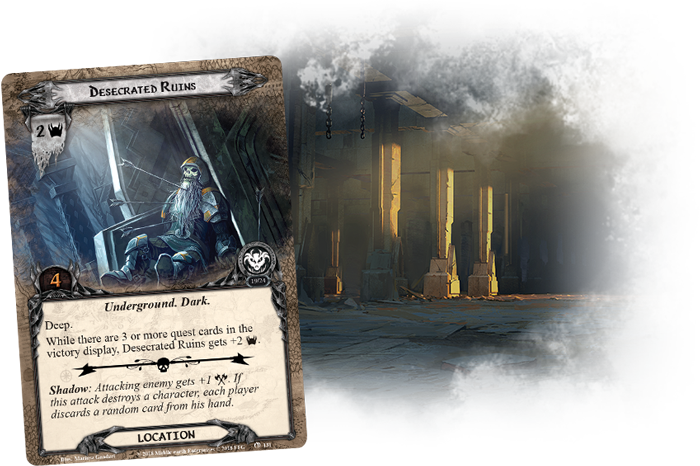 From locations within Gundabad to tricky situations, each quest card impedes your progress in its own way. 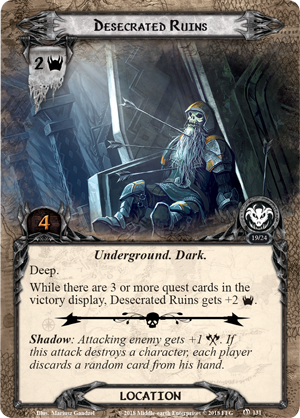 Stumbling into The Lower Deeps (Mount Gundabad, 137), for example, means the "when revealed" effects of the first treachery card revealed each round cannot be canceled, leaving you at the mercy of whatever you bump into in the dark. Fortunately, many of the quest cards you encounter can be bypassed, removing all progress, but simultaneously moving it to the bottom of the quest deck and allowing you to move on to the next quest card. In the end, you’ll have to carefully choose which threads to pursue—the more progress you make, the more you’ll draw the attention of Dagnir and her servants. 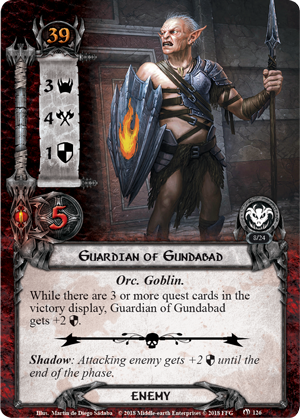 Should you encounter a Guardian of Gundabad (Mount Gundabad, 126), for example, you’ll need to be wary of its high attack value. But if three or more quest cards have been added to the victory display, it's even more difficult for you to chip away at this enemy's hit points. 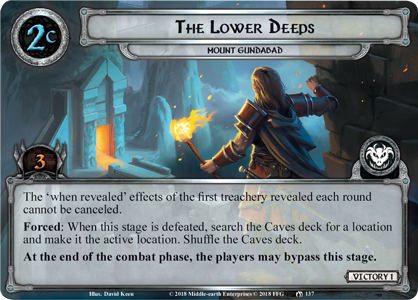 Similarly, having more quest cards in the victory display can make the Desecrated Ruins (Mount Gundabad, 131) a much more dangerous place for you to linger. Sneaking into an Orcish stronghold and defeating a massive dragon is a tall task for any group of adventurers. Fortunately, Mount Gundabad brings you help from some of the most unexpected places. 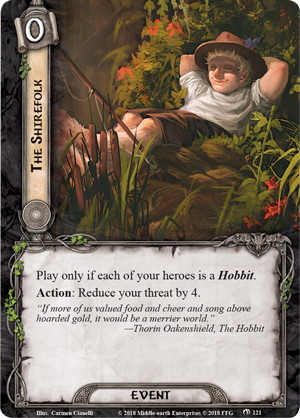 Despite their small stature, Hobbits have a special knack for being useful in these situations. You’ll find plenty of ways for them to prove their worth here, beginning with a new version of Bilbo Baggins (Mount Gundabad, 112). 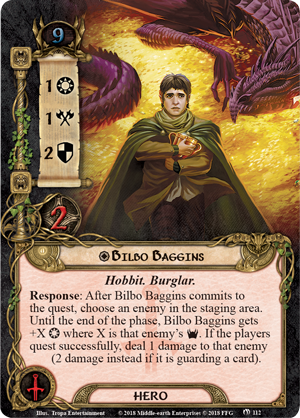 A rather unconventional Tactics hero, Bilbo nonetheless contributes to both adding progress to your quests and dealing damage to enemies. Not only can he add an enemy’s threat to his willpower during a quest, he also deals damage to that enemy if the players quest successfully. 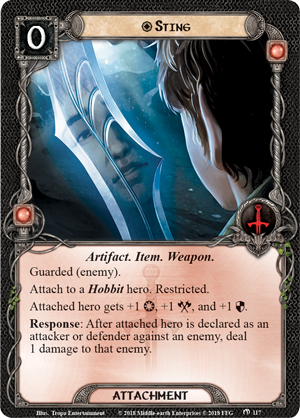 While equipped with his trusty blade Sting (Mount Gundabad, 117), Bilbo gains even more potential—perhaps enough to deliver a killing blow before suffering wounds himself. 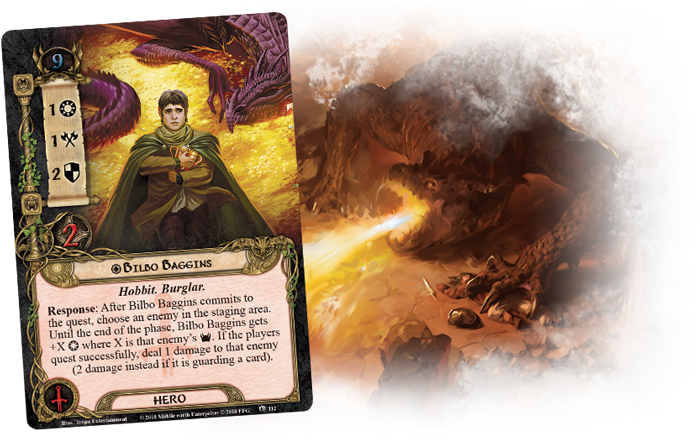 Not all hobbits are as ready to leap into battle, but that doesn't mean they can’t help you stay out of harm’s way. 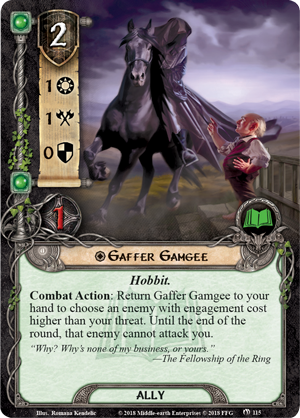 Gaffer Gamgee (Mount Gundabad, 115) is particularly good at pointing enemies in the wrong direction. Returning him to your hand prevents a powerful enemy from attacking until the end of the round. Thankfully, the carefree attitude of The Shirefolk (Mount Gundabad, 121) helps them appear as less of a threat to your enemies, helping you continually make use of the Gaffer. All your efforts have led to this. Can you snuff out this threat to Wilderland? Or will you lose yourself under the mountain? Pre-order your copy of Mount Gundabad (MEC70) at your local retailer or online through our website today! Look for Mount Gundabad to release in the first quarter of 2019.